Two places on the one post eh? Although I don’t usually post more than one restaurant on any one post (unless if it’s a travel post), these two joints really go hand in hand. It’s like a marriage made in heaven or more like they’re really located in the same place. But seriously, they really do complement each other. 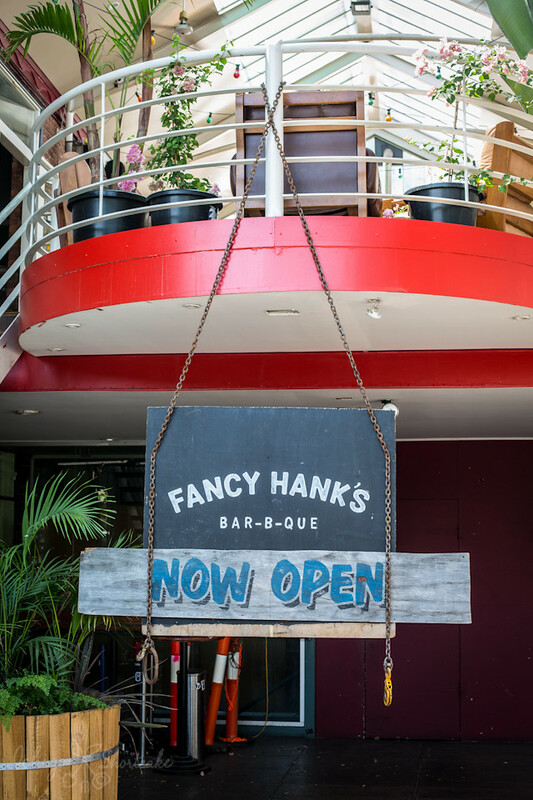 Fancy Hank’s is an American style BBQ restaurant serving up meaty platters and burgers with meat that have been slow cooked, smoked and barbequed the good ‘old American way. 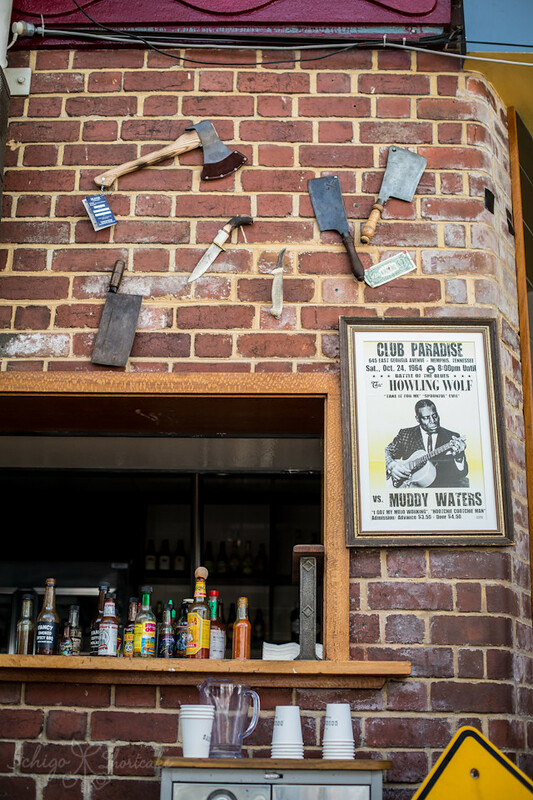 American BBQ restaurants have been quite popular in recent years with new joints opening up all the time. This suits me well since I love my meat. 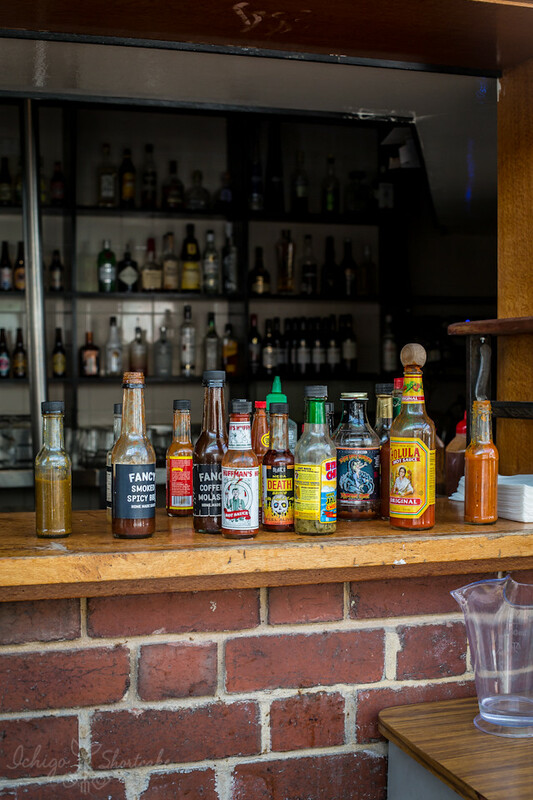 You like to dunk your food in sauces of all types? Well they’ve got just what you’re looking for. 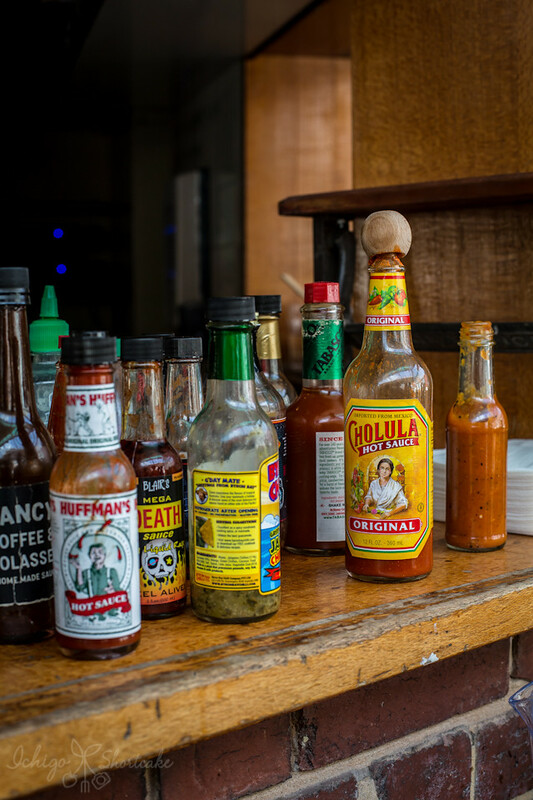 Perhaps a little bit of fiery Death sauce is to your fancy or maybe just some smoked spicy BBQ sauce suits you better, whatever it is you can pile it up at the counter. When we visited though we weren’t all that hungry so Yuye and I decided to order a burger each instead of the meat platters. Please excuse the messy sauce drippings…we’re not the neatest eaters, especially when it comes to meaty burgers. There were only two burgers (or sandwiches as they call them) available (both $10 for classic sizes), one was the Fancy Sanga with brisket, cheese, pickles and sauce, while the other was the pulled pork with pork, slaw and Kewpie mayo. The burger buns were soft and meats tender and tasty albeit being a tad small, maybe we should have up sized to the monster size for $16 instead. We still enjoyed them a lot and being small was actually a good thing too because that meant we could fit in some doughnuts! 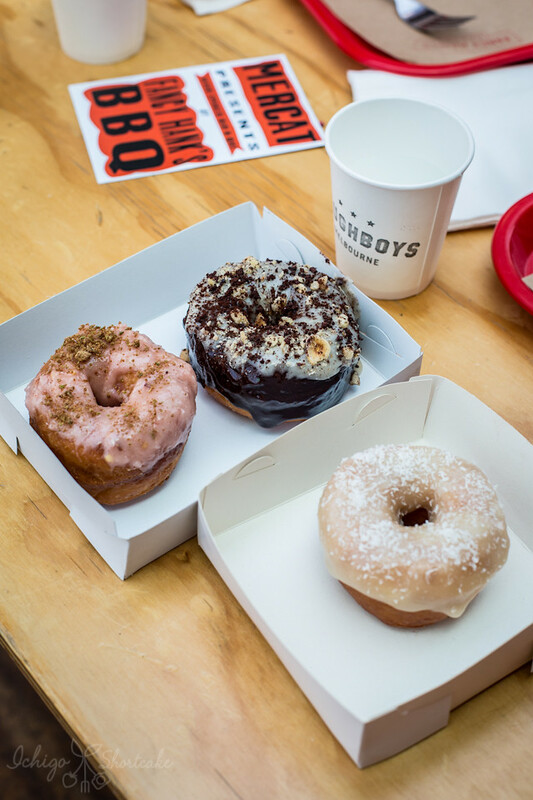 Doughboys is right next to the Fancy Hank’s counter and their doughnut flavours sound so enticing I really wanted to get one of each. The flavours do change quite often I believe and at the time we went for the water buffalo ($4.80) with reduced watermelon, chilli and lime zest with coconut sap sugar as well as the Double D ($5.80) – not the type you’re thinking ahem, but rather double dipped in first a dark monsieur truffe cocoa and second dipped in crunchy peanut butter, topped with roasted nuts and Belgian chocolate. Both sound good? They were. Being slightly on the heavy side (dough plus a whole lot of the toppings? duh) and quite sweet (they’re doughnuts aren’t they?) we struggled to finish the two of them between us so came Racheese and Sat to the rescue. 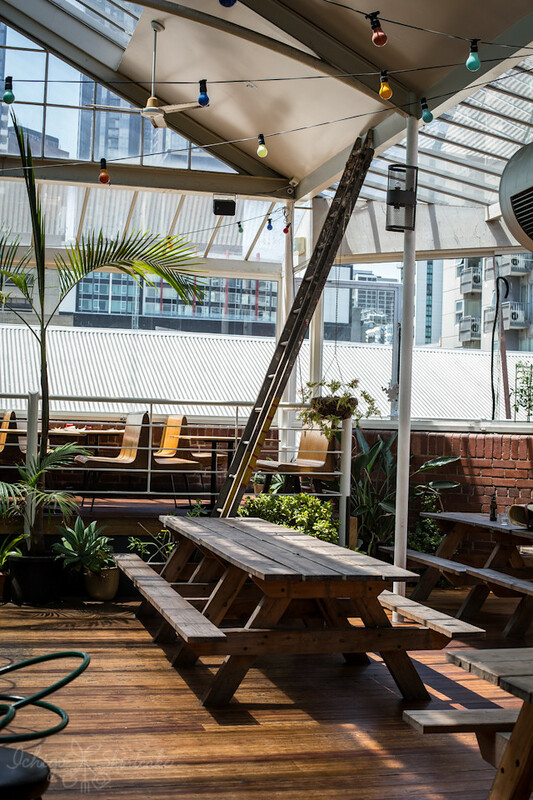 It didn’t help that they also ordered a doughnut – the summer lychee ($4.80) – which surprisingly tasted like lychees! 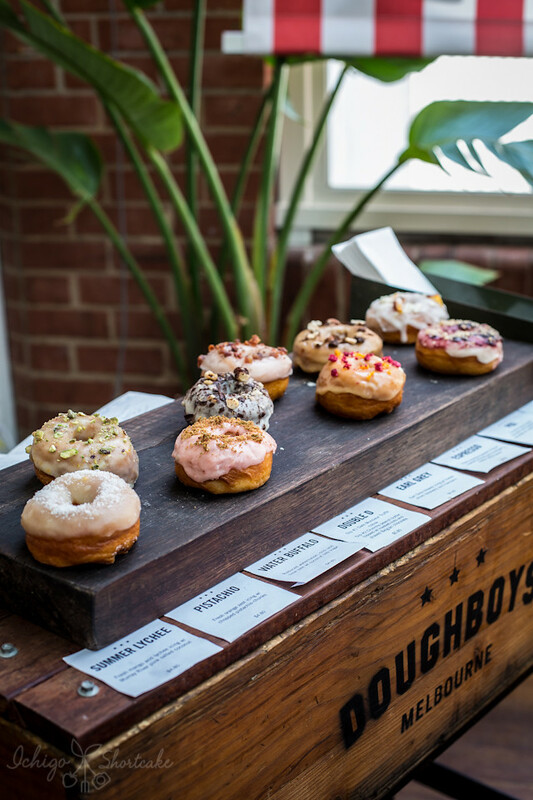 As you have figured out, they’re not your usual cinnamon doughnuts which you can eat a dozen of, rather perhaps 0.5-1 per person is the most we could handle. They were large and filling which meant they also cost a little more. It was a good idea to order a latte to cut the sweetness. 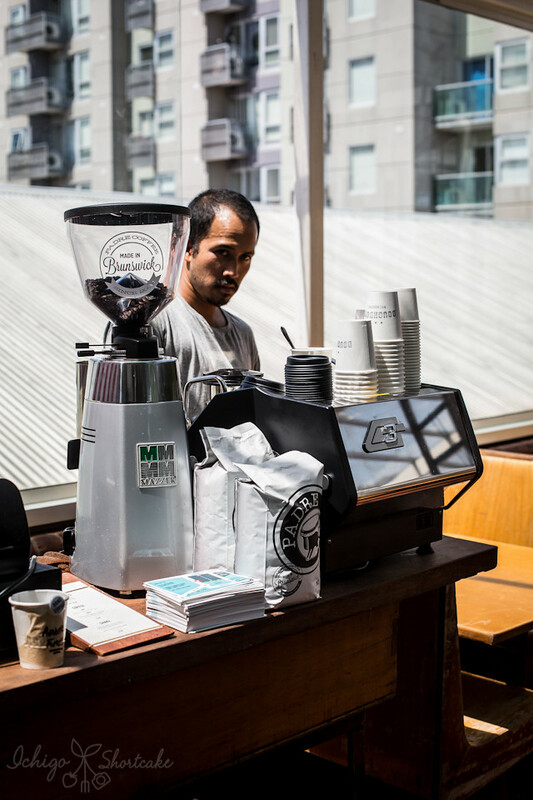 The coffee beans used here were from Padre which is one of my favourite beans. It was smooth and robust, just right to wash down those doughnuts. 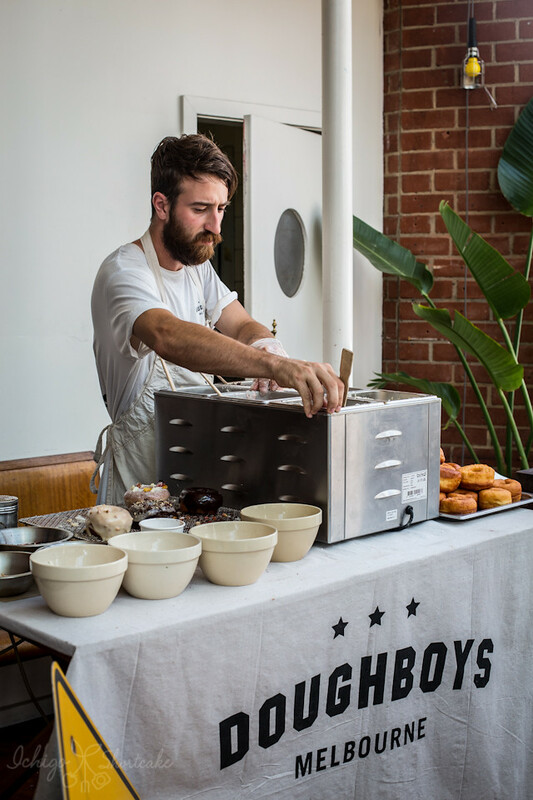 Doughboys can also be found stocked at some of the best cafes around town like Top Paddock (no wonder the doughnuts looked familiar!) and Patricia Coffee Brewers. 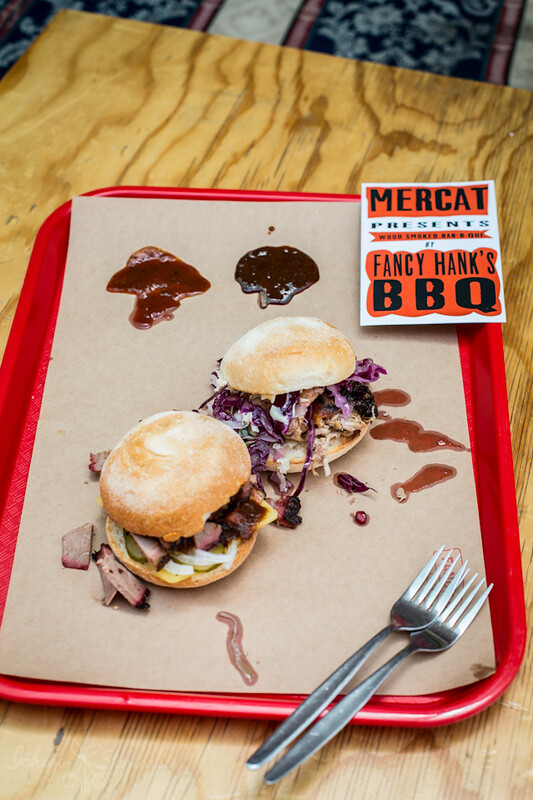 We didn’t have an issue with Fancy Hank’s running out of stock like a lot of people are complaining about, when we visit again and order the meat platters I will report back. 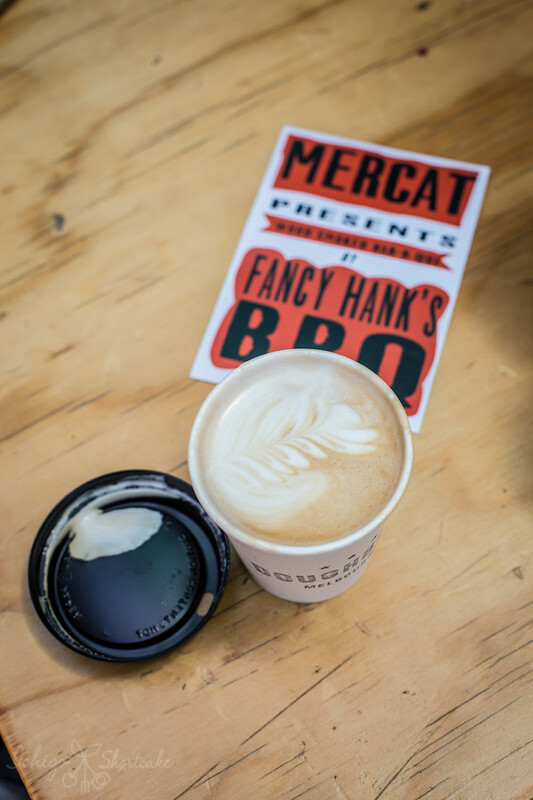 Until then we found Fancy Hank’s and Doughboys quite delicious and definitely will be back again. Feel free to contact me when you’re down 😉 Happy to take you around! !